Do You Have a Ductless Air Conditioner? Find Out About Maintenance Must-Dos! Ductless air conditioning systems, often called ductless mini-splits, or just mini-splits for short, are a fairly new addition to mainstream A/C options. Some people opt for a ductless A/C system when their old HVAC system finally bites the dust. For other people who may be installing A/C for the first time, a ductless system circumvents the lack of an existing air duct system to connect to. In the right space, a ductless air conditioner can be an energy- and cost-saving choice. But just because there aren't any air ducts to worry about doesn't mean these systems are maintenance-free! In this post, learn about the basic maintenance you should be doing to keep your ductless A/C unit humming merrily all year long! If you are like many homeowners who inherited your A/C unit along with a new home purchase, you may not be totally sure what type of A/C system you have. A ductless air conditioner works similarly to a central (air duct-based) system. There is a compressor unit outside the home/office and a fan coil unit inside the home/office. A remote control and sensor system operates the unit to adjust temperature in each connected room. 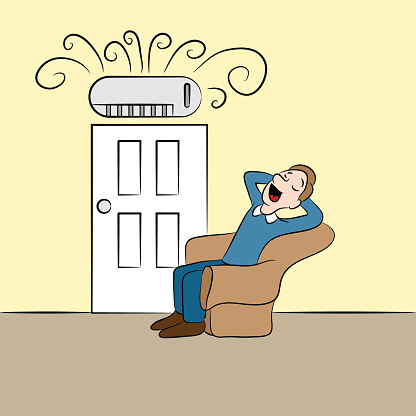 If your system resembles what was just described, chances are good you have a ductless air conditioner. First things first: if you have just moved and your new home has a ductless A/C unit, or if the same holds true for your workplace, it is a good idea to have a professional technician do a formal inspection, cleaning, and maintenance check right away, and then at least once a year thereafter. This will highlight any possible brewing issues that can become major repairs if left unaddressed. Scheduling an initial inspection and cleaning will also give you a baseline for evaluating the overall health and lifespan of your unit. Once this is completed, you should mark your calendar with certain routine maintenance and inspection checks to keep your ductless A/C unit in tip-top working condition. Air filter cleanings The filter is typically located on the front of the indoor portion of your ductless A/C unit. You can simply open the front cover, remove the filter, wash and clean it, let it air dry, and then reinstall it. It is great to do this on a temperate day when you can also open windows and doors to ventilate your home. Coil cleanings When you clean the air filter, you should also clean the coil, which is typically located in the outdoor portion of the unit. You can use a regular hose to run water through the coil (be sure to cut off the unit's power before you do this!). Outside unit visual inspection While the power is off to your ductless A/C unit, you should take the opportunity to visually inspect it and its components. What you are basically looking for here is that all connections are tight; no wires or components look stripped, pitted, deformed, or leaky; and the surrounding area is clean and free from dirt and debris (including overhead). Drain hose check Here, you just want to be sure the hose responsible for draining excess condensation away is not leaking or clogged up. Indoor unit inspection and cycle test Once you have restored power to your A/C unit, you can visually inspect the indoor portion of the unit and do a test run to be sure it cycles on and off as directed. If you have both a heating and cooling component on your ductless system, you will want to check these in advance of seasonal changes as well. Unless you have HVAC training, you may find your A/C unit's lifespan is best served by bringing in a professional technician to handle repair issues. Your regular inspections will also go a long way towards ensuring any repairs are more minor than major. Refrigerant or coolant leaks Not only will it be necessary to refill the leaking liquid, but your technician will identify what has been causing the leak, where the leaks are happening, and what repairs are needed. Leaking or clogged drain pipe There are all kinds of reasons why the drain pipe may spring a leak or, alternately, become clogged with debris. Your repair technician will be able to repair the issue and also work with you to ensure it does not recur. Poor or pitted electrical wires/connectors. Most aA/C-related home fires start on account of poorly maintained electrical connections. Your repair technician can identify which wires and connectors need to be repaired or replaced and tighten existing good connections as well. Damaged coil fins When the delicate fins on the compressor coil get smashed or damaged in some way, which can be common for ductless A/C units, your technician can bend the coils back into their proper shape or replace them. Thermostat accuracy Your technician can verify that your remote control and sensors are working accurately with your unit to achieve and maintain your temperature preferences as your ductless A/C unit cycles. Shipton's Heating & Cooling has been serving the HVAC needs of customers living in Hamilton and the surrounding areas for nearly a century! Call us at 905-549-4616 or visit us online to schedule a free cooling and heating consultation.